Join a mission to Mars, fly to the moon, intercept a comet, or study Earth from the far reaches of space all without ever leaving Louisville! 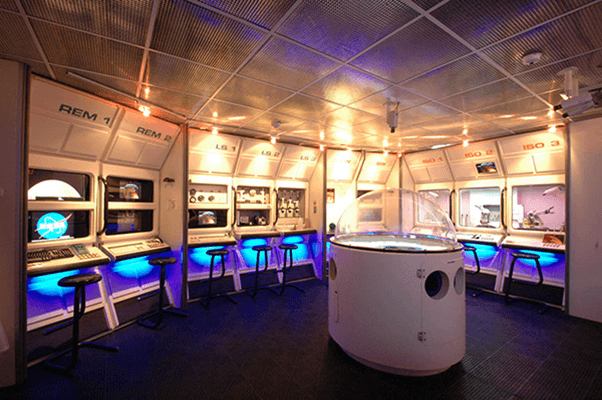 Challenger Learning Center simulations put science and communication skills to the test as your mission control and space station teams communicate to meet the challenges of space exploration. To learn more about Challenger Center programs and opportunities, contact our Challenger Center Flight Director at 502-560-7151, or at Veronica.Greenwell@louisvilleky.gov. Head to the moon and learn about lunar science while searching for resources like water, iron and titanium, track exoplanets in nearby star systems, and work to ensure the safety of your crew. Your team will head to the moon and search for potential sources of water, and learn about lunar science. Students will search for valuable building materials like iron and titanium, track exoplanets in nearby star systems, and ensure the health and safety of the crew. Members of your crew will also construct and launch a rover to the lunar surface to search for ore and water.